Incoming calls can be received and outgoing calls can be made using the telephone in the property, payment is via an honesty box. This property welcomes two dogs. Towels are not available. Disruption in first part of 2019 due to neighbouring building work. Offering wonderful sea views over Porthcothan Bay this detached house is set within the village of Porthcothan, less than 5 miles outside the picturesque fishing village of Padstow and benefits from direct access to the beach via a footpath at the bottom of the spacious rear garden (not suited to any guest with limited mobility). Long Cove was built in the late 1930's and has been in the ownership of the current owners family since 1953. 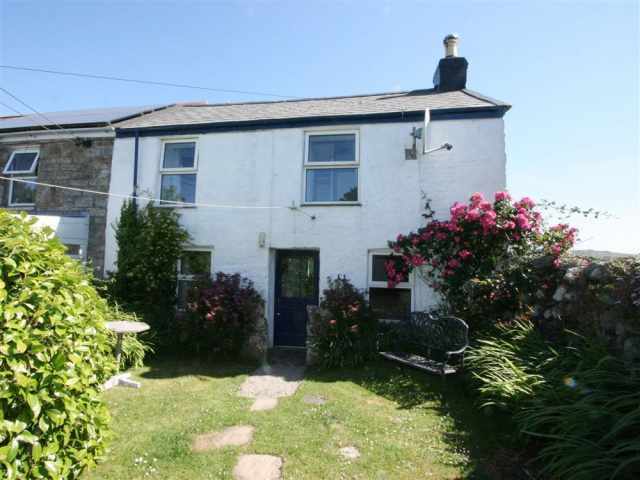 The property has been comfortably and traditionally furnished with sea views across the striking Porthcothan Bay from the ground floor accommodation and further sea views from two first floor bedrooms. During the season, the Porthcothan Bay Stores sell local pasties, ice cream, newspapers, cake, takeaway coffee, milk, bread and all manner of beach goodies. In addition, surfboard and wetsuit hire is also available from the store.... do pay them a visit. The closest village of St Merryn, approximately 3 miles away, has a village shop, pub and post office. The fishing village of Padstow is within a 15 minute drive and offers various shops and a good selection of fish restaurants particularly Rick Stein's and Paul Ainsworths No 6, Padstow Museum and a Tesco Supermarket. It is possible to hire bicycles to explore The Camel Trail which runs from Padstow to Wadebridge and boat trips running from the harbour and a ferry across to Rock. Alternative nearby beaches include Constantine Bay, approximately 2.5 miles away and Harlyn Bay, within a 10 minute drive. Both of these beaches, and Porthcothan Bay, are dog friendly beaches all year round. From Porthcothan Bay there is access to the South West Coast path. 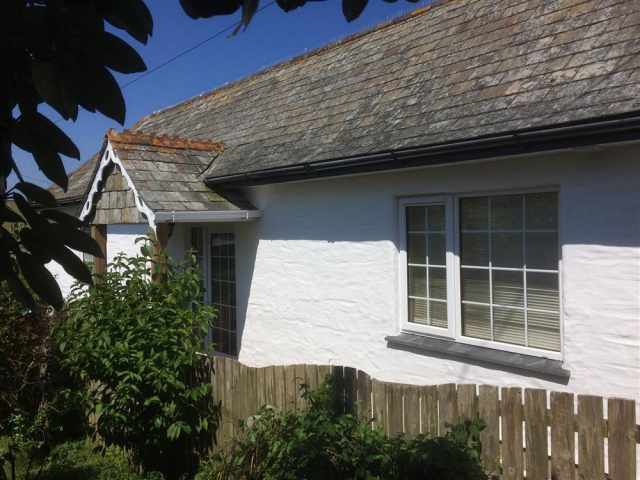 The nearest golf course to the property is Trevose which is situated approximately 2.5 miles away. Prideaux Place & Gardens is an Elizabethan Manor and Gardens and is within a 15 minute drive. The property offers parking for three cars upon a paved pathway with two gates and steps giving access to the garden and patio leading to the front door. A single step up to the front stable door leads into the ground floor hallway which provides access to the bathroom W.C with a bath, electric shower over and basin. A couple of steps lead down to the ground floor W.C and utility room. From the hallway a door opens into the well equipped kitchen with an electric Aga as well as regular electric oven and hob, plenty of storage and wonderful sea views stretching the expanse of Porthcothan Bay. To one side of the kitchen is a breakfast bar which provides glorious views over the beach and door which leads out to the rear decking. This room then leads into a comfortably furnished lounge/dining room with comfortable lounge seating arranged in front of a central fireplace, a dining table and chairs alongside a piano arranged in front of the picture window with coastal views. Off the lounge is the owners study (which guests are welcome to use) and where you will find the Broadband router, telephone with honesty box and highchair. To complete the ground floor accommodation there is a games/reading room well equipped with books and games. This room then leads into the ground floor twin bedroom with sea views and en-suite bathroom W.C with a Jacuzzi bath, wash hand basin and heated towel rail. From the kitchen, a carpeted narrow steep staircase with handrail leads up to the first floor where there are three comfortable and simply furnished bedrooms, a W.C and separate shower room both with a basin. There is a small step up to the W.C and the hallway which leads to the bedrooms and a small step down into the tiled shower room. There is one double and two twin bedrooms, one with a cot. The garden spans three sides of the property with established trees and shrubs, sloping lawns with direct access onto the beach via a gate and rough path. A raised decking area benefits from glorious sea views expanding the full length of Porthcothan Bay with informal bench seating. - Incoming calls can be received and outgoing calls can be made using the telephone in the property, payment is via an honesty box. - Towels are not available. - Disruption in first part of 2019 due to neighbouring building work.